The Ice Pro (and Ice Pro Flow boots) fit more snugly than other Forma boots, and in our judgement, they fit about one size size small as compared to other European sized boots. We think the width is “medium” or C/D. So my advice would be to use the chart below to choose your European size based on your US shoe size, and then buy one European size bigger than the chart indicates. Same advice goes for using Forma’s foot sizing advice mentioned below…. whatever size you determine by measuring, choose one size bigger. The Forma Ice Pro boots are a premium race boot from a brand we really like. We’ve been a fan of Forma’s adventure boots for a number of years for their quality and reasonable price. These race boots by Forma are also a good value in our opinion. As you can see in the photos, this race boot has the hard plastic protection system built around the ankle and shin that you find on nearly any high quality race boot. These pieces are designed to pivot at the ankle to all for easy flexing front to back, but they are stiff side to size when you need them to be (during a crash). The hard molded pieces will help disperse sharp impacts if you go down. The toe and heel are also heavily reinforced for impact. The Ice pro comes in two versions… the “regular” and the “flow”. The flow version is what you might have guessed… one that flows air for warmer weather use. The foot area of the flow boot is perforated microfiber where the non-flow is solid. Also, the flow version has a functional heel vent molded on the outside of the heel area to scoop air. The non-flow looks the same but the vent is non functional. The vent on the back of the heel on both versions is just for show. Some race boots use a softer suede material on the inside of the boot to help you interact with the bikes body parts and “grip” better than hard plastic parts might. This boot uses softer rubber on the inside of the shin and heel and then the sole wraps up the side of the foot a bit too. Those three points of contact are softer and not as slippery as the harder plastic parts they are affixed to. 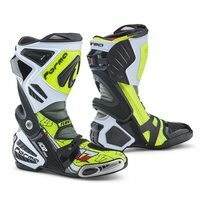 Forma says: The Forma Ice Pro FLOW replica boots are extremely technical and developed over a generation of MOTOGP and WSBK racing. Designed for maximum feel and performance, the vented micro-fiber construction is protective and lightweight. The FCS system brings lateral stability and ankle support. A special compound race sole for feel and total control. Re-buildable for when you push the limits, comfortable like traditional Forma bloodlines. It’s time to race, it’s more than an aspiration.